To make béchamel, melt 2 Tbsp butter in saucepan. Add ¼ cup flour, cooking about 2 minutes. Then whisk in 1 cup of cold milk. Bring mixture to a boil, stirring constantly. Simmer about 15 minutes until the mixture is thickened. Remove from heat and chill. This may be made a few days ahead and kept refrigerated. Combine bread crumb, parmesan, parsley, and melted butter, mixing thoroughly. 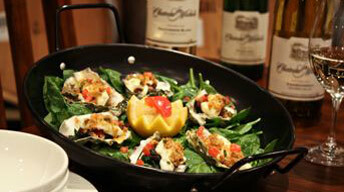 Open oysters and remove from the shell. Reserve bottom shell and liquid. Remove muscle and clean shell thoroughly. Dice and sauté pancetta or bacon until crispy. Remove from the pan and add garlic and spinach. Cooking quickly, wilt the spinach being careful not to burn the garlic. Remove from the pan, and lay 2 spinach leaves in the bottom of each shell. Replace the oyster and sprinkle with pancetta. Cover with 1 Tbsp béchamel. Put chopped lemon zest on the top and cover with bread crumb mixture. Bake in the oven at 450ºF for about 7 minutes or until topping is browned. Remove from the oven and cool about 3-4 minutes. Add tomatoes to garnish before serving.